As a prostate cancer survivor, I often use this blog (my ethics speaker blog) to discuss issues of prostate cancer and what can be done to cure this disease – dreaded by men worldwide. When I arrived home today there was a wonderful magazine on our kitchen counter – LifeExtension – that my wife brought home. She purchased it for other reasons, but what caught my attention was an outstanding article entitled: Merv Griffin’s Tragic Death from Prostate Cancer. Prostate cancer kills 300,000 Americans each year. With proven means of prevention and early detection, death from prostate cancer should be a rarity and not so common. 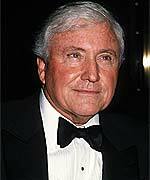 Merv Griffin was initially treated for prostate cancer back in 1996, but the disease returned with a vengeance to claim his life in 2007. News accounts described Merv’s final days living on feeding tubes and morphine drops, as metastasized prostate cancer cells ravaged his bones, liver and lungs. It often takes a celebrity death for the public to pay proper attention to a curable disease. If there is any consolation to the ordeal Merv Griffin suffered, it will be that more men will be screened and follow proven preventive strategies to reduce their risk of developing this insidious disease. For example, a recent study published by the National Cancer Institute showed that men slash their risk of prostate cancer by up to 52% by regularly consuming cruciferous vegetables (such as broccoli and cauliflower). The article is excellent. Is the content a magic bullet? No. But from a vast amount of research I have conducted (for personal benefit), I know that their findings are well documented and simple “life style” changes can have a huge effect on your risk of contracting prostate or breast cancer. Having been diagnosed (quite by accident) at 47 with prostate cancer, I know what it feels like to be told – when you think you’re healthy as a horse – that you have cancer. After getting over the shock – I began extensive research as to the treatment that would allow me to avoid what Merv Griffin faced. Today, based on my routine tests, I am cancer free. However, let me caution my readers – much as I was cautioned not long ago – surgical removal or any other treatment does not mean that cancer can not return. Merv Griffin is a perfect example of what can happen. Hence, for those of us who have been diagnosed and successfully treated for prostate cancer, we cannot reduce or ignore methods for reducing risk or maintaining health. This entry was posted on Thursday, January 10th, 2008 at 12:49 am and is filed under Prostate Cancer. You can follow any responses to this entry through the RSS 2.0 feed. You can leave a response, or trackback from your own site. Treating advanced prostate cancer with radiation and hormone blocking drugs could, could cut the death rate in half according to astudy of Scandinavian men. In the United States the combination has been standard care since the 1990s, but in Europe many doctors have avoided the combo treatment and used hormone drugs alone thinking the pair would be too harsh for most patients. What the study shows is that men with prostate cancer do benefit from more aggressive therapy according to Dr. Howard Sandler of Cedar Sinai Medical Center in Los Angeles, and a spokesman for the American Society of Clinical Oncology. The Scandinavian researchers tracked 875 men with advanced prostate cancer in Denmark, Norway and Sweden. About half were given hormone blocking drugs, while the other half got the same treatment plus radiation. The drugs block production of testosterone which feeds cancer cells. This is a working draft of an article that will appear in December/2009 issue of Life Extension Foundation Magazine by Dr. Steven Nemeroff. Thought it might be of interest? the 300,000 deaths per year stat is, I think a mistake. its more like 300,000 new cases of pros can per and about 25,000 to 30,000 deaths per year. still no small amount.